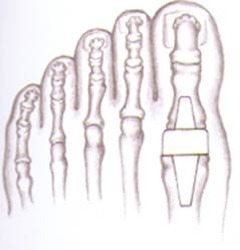 This is a condition that affects the same joint as a bunion, however on the top rather than the side. This is the result of arthritic and degenerative changes occurring at the joint from wear and tear. Typically, spurs or bony growths form on the top of the joint causing pain and restricting motion. Often, the joint becomes permanently ruined and cannot be salvaged. Initially, steroid injections or orthotics may relieve the pain, however in the long term, surgery is usually indicated and there are a variety of options available depending on the individual situation. 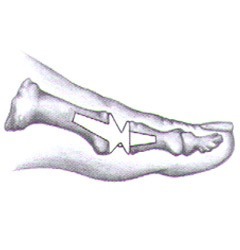 This can include simply shaving off any excess bone, shortening the metatarsal to decompress the joint, fusing the joint, and replacing the joint with an implant. 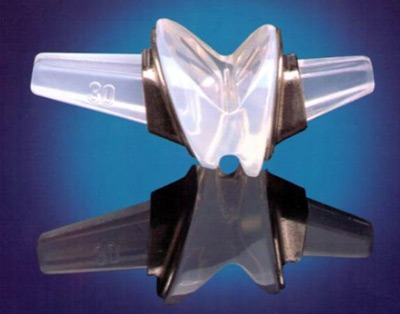 More recently, synthetic joint fluid has been used to lubricate the joint with some success and this can buy time before surgery is performed.